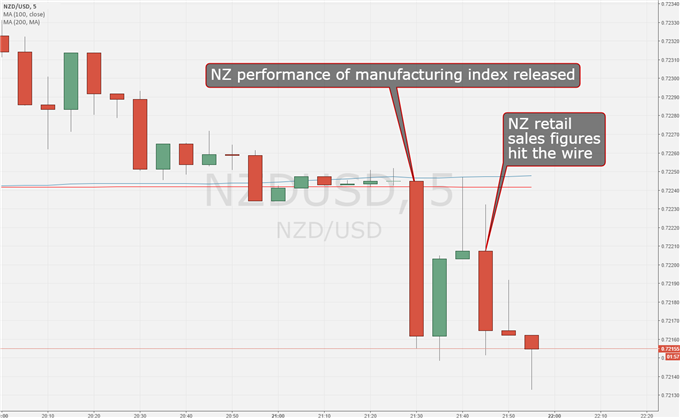 The New Zealand Dollar was buffeted by a double data miss Retail sales were below expectations for January The manufacturing sector also came up short The New Zealand Dollar was hit early Friday thanks to two economic data misses and the reported views of its central bank. The currency was hit early by an underwhelming performance form the country’s Performance of Manufacturing index for January. This is like the Purchasing Managers Indexes released elsewhere. A number above 50 indicating expansion in the sector, while anything below that means contraction. January’s came in at 51.6, but that was well below the 54.2 chalked up in December. BusinessNZ publishes the index and said that the Christmas holiday break and bad weather conditions may have affected manufacturing performance. Looking on the bright side it said that those survey respondents who mentioned neither factor often reported business as usual. NZD/USD slipped on these figures, and did so again shortly afterward on the release of retail sales figures for the final three months of 2016. They rose 0.8% on the quarter, below the 1% gain expected. The previous quarter’s rise was revised down to 0.8% from 0.9%. The data weren’t all bad. StatsNZ said that eleven of the fifteen retail sectors reported higher sales volumes over the quarter. Still, NZD/USD slipped after this data double whammy. It was at 0.72155 in the aftermath, below 0.72244 before the numbers. Some reported commentary from the Reserve Bank of New Zealand crossed the wires as the data came out. They didn’t help kiwi bulls much either. Reportedly a briefing to an incoming finance minister given earlier this year, it said that upward pressure on NZD may be turning, but that monetary policy is expected to remain accommodative. Want to know more about the financial markets? Why not take a look at the DailyFX Trading Guide? We recommend using RobotFX trading tools. Singapore’s exports rose again in January That makes a third straight month of gains But where the goods are going is as important The Singapore Dollar was steady against an already weaker US counterpart on Friday on news that is home’s export recovery continued in January, and largely thanks to Chinese demand too, which could have welcome repercussions way beyond the city state. Singapore’s Non-Oil Domestic Exports (NODX) rose 8.6% on the year in January, according to official data. That was below December’s 9.1% rise, and way below November’s 15.6% bonanza. But it was still a strong gain and much above the 7% or so which markets had expected. It was also a third straight rise. That will be a welcome sight for Singaporean policy makers after a very patchy 2016. Compared with December, exports rose a chunky 5%, more than reversing that month’s 2.4% slide. The meat of this data came in the breakdown, however. Exports to China soared 36.9% on the year, smashing the previous month’s 23.7% gain. Other big destinations were South Korea and Taiwan, but all of Singapore’s major markets saw export gains with the exception of neighboring Malaysia. News of the Chinese contribution to Singapore’s ongoing export health chimes well with storming official trade figures already released from the world’s second-largest national economy. Even allowing for some trade “front loading” thanks to the relatively early timing of China’s major New Year festival, a constellation of trade data is starting to suggest that China’s economy is revving nicely. The Singapore Dollar was already gaining on a generally weaker greenback when the data were released. 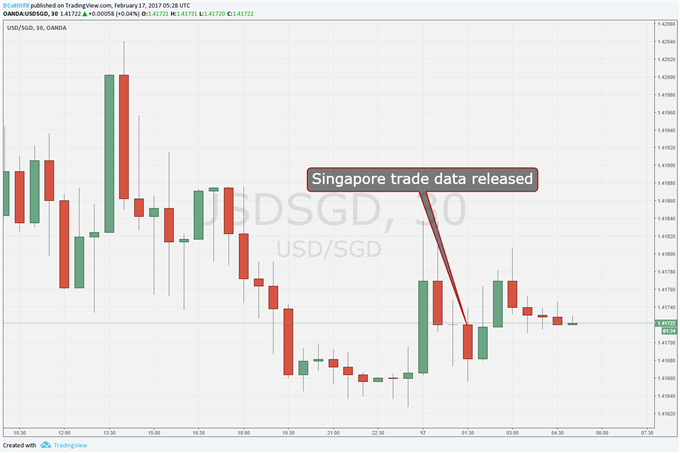 USD/SGD got down to 1.41656 in the wake of the report, but had been edging down from the week’s peak of 1.41652 since Wednesday. That peak was scaled when Federal Reserve Chair Janet Yellen suggested in Washington that a US interest-rate rise could come quite soon. The city state’s currency trades under a “managed float” regime, meaning it is permitted to fluctuate freely, but within an undisclosed band. Do you want to know more about financial markets, or would you like instant analysis of the most important economic data? Either way, the DailyFX webinars could be for you. Market sentiment, technical analysis, important levels, and Elliott wave. Connect via: Sorry, I could not read the content fromt this page. The USD/CNH set a higher low this week than the previous two weeks. 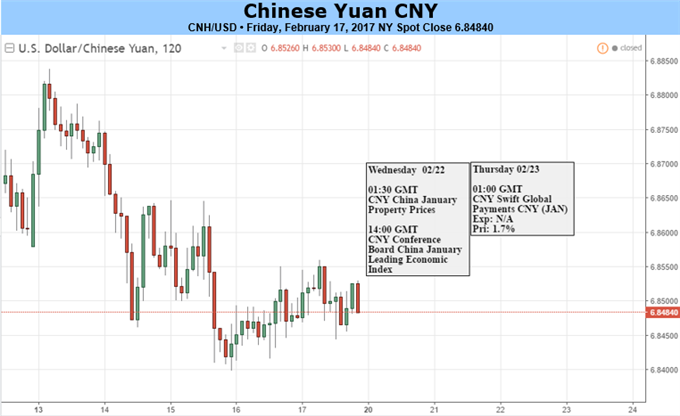 The onshore Yuan, on the other hand, remained within a tight range for the third consecutive week. The two Dollar/Yuan pairs have been driven by different themes of recent: The Dollar’s strength weighted more on the offshore pair, while the onshore Yuan eyed more on moves from China’s Central Bank. As the spread between the offshore Yuan and the PBOC’s guided level narrows, this segregation could be eased over the following periods. In terms of the offshore pair, the odds and timing of the U.S. Federal Reserve raising rates, as well as expectations on U.S. President Trump’s tax cuts plan have been primary drivers to its trend and this likely continue to be the case. Fed Chair Yellen’s two-day testimony added mixed moves to Dollar pairs, including the USD/CNH. Next week, the U.S. economic calendar is dotted with housing and labor gauges, which are expected to add volatility to Dollar pairs. On China’s side, event risks would be low amid a light calendar; the major focus will be on China’s Central Bank. The top policymaker has been reducing excessive Yuan liquidity since the Lunar New Year, targeting at bring monetary policy back to normal from slightly loose. However, this tweaked credit strategy did not bring much impact to the offshore Yuan over the past few weeks. Normally, a tighter policy would send the county’s currency higher. Let’s take a look first at why it did not work, as this may help us find out when it will. The PBOC has been using open market operations as well as lending facilities to withdraw excessive cash from the financial market. Suspending and resuming liquidity injections through reverse repos and increasing target lending rates aim to delicately adjust liquidity to desirable levels. These moves are different from a hike in reserve requirement ratio which will have a long-lasting effect to the economy and in turn a greater impact to the Yuan. More importantly, the offshore Yuan was already stronger than the guided level set by the PBOC. Since early January, the offshore Yuan has been both above the onshore Yuan and the Yuan fix (except during the Lunar New Year) until this week. This means that from the regulator point of view, the offshore Yuan might have been already overvalued. However, as the spread between the offshore Yuan and the Yuan fix narrows, this could be changed. The PBOC has strengthened the Yuan fix for four consecutive days this past week. On Wednesday, the offshore Yuan dipped below the PBOC’s guided level, the first time in two weeks. As of 1:40pm EST, the reversed spread has expanded to 50 pips. Traders will want to keep a close eye on the PBOC’s guidance next week. If the policymaker continues to recognize levels of the offshore Yuan, the link between the onshore and offshore markets could strengthen again, and onshore policies may weigh more on the offshore pair. Looking for trading ideas? See our Trading Guides. The title of Wednesday’s post was, “DAX Gearing Up for New Highs”. Not so fast. The market since that morning has been ‘soft-ish’, but nothing to get overly concerned with just yet. The short-term chart (hourly) suggests more downside could come if the market can’t soon bounce, but there is trend-line support not far below on the daily should sellers arrive. A head-and-shoulder-ish pattern, or possibly a descending wedge could come into play real soon. The H&S formation has a weak right shoulder; the symmetry isn’t the best but still qualifies in our book as a valid formation. A clean break below 11725 exposes the downside regardless of what you want to call the configuration – H&S, wedge, or any other name you want to give it. We will look to the trend-line rising up from December and gap-fill from 2/13 at 11665 as the next levels of support on a break. However, if support holds and we see a pop higher, then bearish bets are off and we’ll have to start looking upward. An aggressive break lower and undercut of the trend-line extending back to early December would be of concern for wagers from the long-side looking out beyond the very short-term. For now, though, global risk appetite continues to remain buoyed, and until we see aggressive price action lower we will run with the notion of weakness being nothing more than a healthy pullback for what could later be the DAX gearing up for new highs. See the Webinar Calendar for a schedule of upcoming live events with DailyFX analysts. – Fed Chair Janet Yellen’s two-day Humphrey-Hawkins testimony evoked some interesting volatility this week; first with a very strong Dollar after day one, followed by a very weak Dollar and very strong gains in stock prices after day two. – Next week’s economic calendar is relatively light, and this can be a great time to gauge market sentiment around current themes and trends. – If you’re looking for trading ideas, check out our Trading Guides. And if you’re looking for ideas that are more short-term in nature, please check out our Speculative Sentiment Index (SSI) Indicator. As we move towards the close of a week that’s seen quite a few drivers come into markets, it’s time for traders to start trying to look around-the-corner to see which themes may be driving price action in the week ahead. Next week’s economic docket is relatively light. The highlight for macro themes will likely be the FOMC Meeting Minutes from the Fed’s February meeting to be released on Wednesday. Below, we dive into U.S. equities and the U.S. Dollar. U.S. Stocks: To Infinity and Beyond? U.S. Stock prices have continued to run-higher, even with the build of risk factors in the macro backdrop. S&P futures have moved-up by a whopping 16.2% from the lows of election night, and so far in 2017 are up by 5%. And while U.S. Stock prices are still at historically ‘expensive’ levels, the net-impact of this week’s two-day Humphrey-Hawkins testimony was even-higher stock prices; so the one major risk factor to continued gains in equities prices – a higher probability of faster rate hikes from the Fed – does not appear to be a limiting factor at the moment. As for drivers? This is likely quite a bit of hope with a good deal of excitement. A lot of that hope seems to be pinned towards political factors and the prospect of a massive tax cut plan in the United States along with the hope for increased infrastructure spending and growth programs down-the-road. This is likely one of the reasons why so much of the financial media has become fixated on the Twitter account of President Trump, and it does bring up what is looking to be an interesting tango in the months ahead. Given next week’s expectedly quiet backdrop, this would be a good opportunity to gauge market sentiment around this theme. If we do see a pullback in U.S. equity prices next week, this can open the door to a buying opportunity. If we don’t – then fears of ‘exuberance’ and markets getting ahead of themselves should denominate a quiet stance in such venues. Is the Dollar Going to Pick a Direction? U.S. Dollar price action has been rather chaotic this week. What started out as another post-Election rally, with an out-sized reversal starting on the night of the election, the U.S. Dollar faced considerable selling throughout the month of January. But the reasons for bullish trend remained very much alive, as there are/were simply few other economies looking at tighter rate policy options in the near-term. So, as we opened the door to February, that bullish up-trend began to show again; and this week’s events gave that theme some additional fire-power, at least at first. At day one of Chair Yellen’s testimony, she began her prepared remarks by indicating that rate hikes should come sooner rather than later, and she offered an upbeat assessment on the U.S. economy. The following morning, CPI was released out of the United States with a .6% print for January, twice the expectation of .3%, and this further contributed to the Dollar’s gains as the Greenback temporarily traded above a key resistance level at 101.53. But that was short-lived: As Yellen began day two of her testimony, selling took over in the Greenback and has been present pretty much ever since. The main point of contention appears to be around a possible hike in March. On Tuesday (day one of her testimony) odds for a March hike shot-up very quickly as she spoke to Congress. But on day two of that testimony, odds began to drop and haven’t yet revived. The likely driver here will probably come from Fedspeak, at least if this mirrors similar behavior as the past. This is very similar to what we saw in August of last year with Yellen and Stanley Fischer both pledged to near-term rate hikes at the Jackson Hole Economic Symposium. 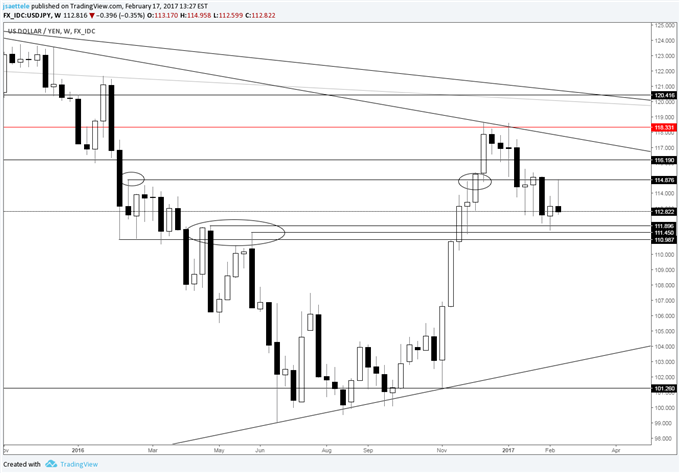 The immediate impact was Dollar strength as traders feared a possible move in September; but as we actually moved nearer to that September meeting the logic of hiking rates just ahead of a pivotal Presidential Election dictated that it probably wouldn’t happen. In that instance – the Dollar didn’t begin to re-strengthen until after the Fed’s September meeting. June seems like a much likely candidate for that next rate move from the Fed, and this appears to be what markets are gearing up for. But any indications of a potential March move – any mentions of ‘three hikes in 2017’ could re-trigger Dollar strength, at least in the near-term, as markets brace for the slightly-increased probability of a move at the Fed’s meeting next month. – The triggering of Article 50 to begin the UK/EU divorce process is probably still six weeks away. 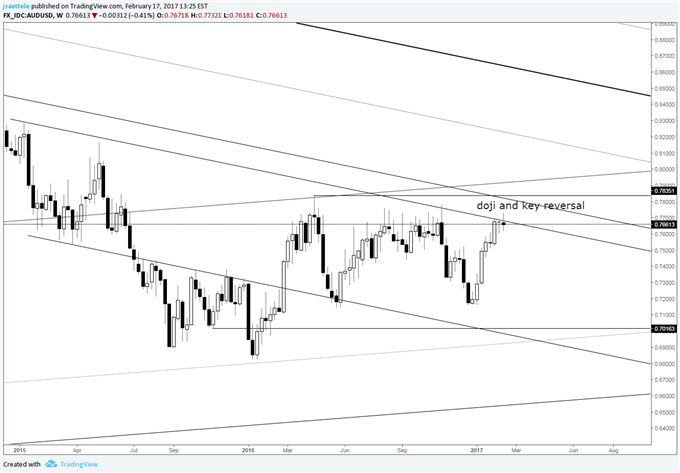 – Over that period and beyond, attention will likely focus on the Euro side of the EUR/GBP cross, and with so much event risk ahead, that could mean weakness. – See the DailyFX Economic Calendar and see what live coverage for key event risk impacting FX markets is scheduled for the week on the DailyFX Webinar Calendar. What could possibly go wrong for the Euro? Actually, rather a lot; particularly on the political front. For a start, there’s Greece. There is currently almost no chance that Greece’s latest bailout will be agreed by the Eurogroup of ministers this coming Monday. Negotiations between the Greek government and its official-sector creditors have stalled due to a refusal by the Greek government to agree to further austerity measures, and so far the International Monetary Fund and the European Commission have been unable to agree on how to tackle the Greek crisis. Germany, in particular, is determined that the IMF takes part, which it currently seems reluctant to do. “We are hearing about the good progress in the talks… with Greece,” a German Finance Ministry spokeswoman said Friday. “We have a convergence. But we are not so far technically that on Monday a final decision on the conclusion of the review can take place,” she added. Concern about the lack of progress in the talks has raised the yield on 10-year Greek government bonds to 7.81% currently from the recent low of 6.43% in early December. Then there’s the European Central Bank. The minutes of its meeting on February 17, released Thursday, suggested it’s unlikely to reduce its current monetary-stimulus program any time soon, in stark contrast to the US, where policymakers seem determined to tighten policy in the coming months. 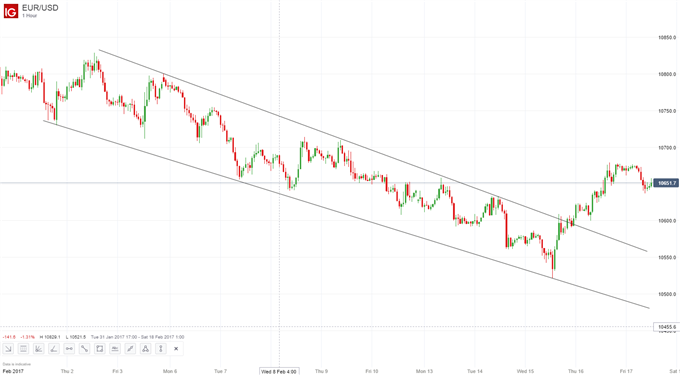 That’s a definite negative for the Euro, even though EURUSD has just broken out of a downward channel on the chart that had previously contained it throughout February. An ECB determined to keep monetary policy loose is likely to lead to Euro weakness not just against the US Dollar but against other currencies too. The Euro also looks likely to suffer from the upcoming elections in the Netherlands, France, Germany and possibly Italy. In the Netherlands, the frontrunner is Geert Wilders, the right-wing candidate, and if he wins as expected that would usher in a long period of coalition talks. In France, the right-wing Marine Le Pen has a chance of victory as both her main rivals’ campaigns are spluttering. And in Germany it’s not impossible that Chancellor Angela Merkel could be defeated. As with EURUSD, EURGBP has broken higher but with all these elections on the horizon it seems unlikely to strengthen much further. The rising tensions within the Euro-Zone have led to a widening of yield spreads between 10-year sovereign bonds in Germany and those in Euro-Zone member states such as France and Italy that are perceived to be less robust financially. Add in talk of a downgrade to France’s credit rating and a breakup of the EU if Le Pen wins the election there, and Brexit could prove to be just a distraction in the weeks and months ahead. Don’t trade FX but want to learn more? Read the DailyFX Trading Guides. –Subscribe to Jamie Saettele’s distribution list in order to receive a free report to your inbox several times a week. Check out the DailyFX Trading Guides and webinars for ideas and education. There is no change to the long term GBP/USD comments, which continues to consolidate above the 13 week average following a sharp reversal. 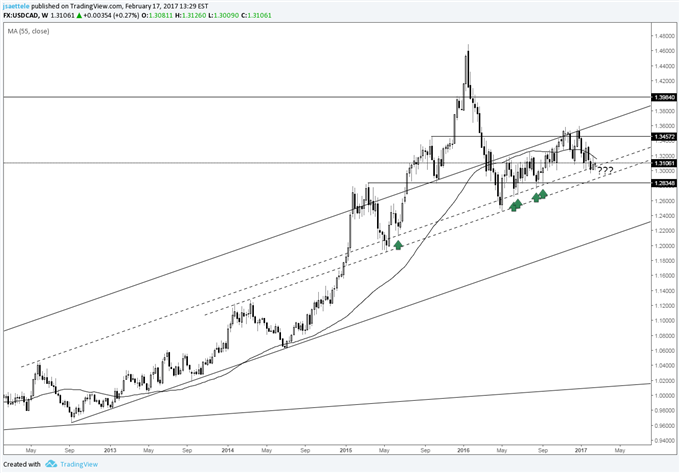 “Cable has followed through on the weekly reversal and closed above the 13 week average. The high is at the November high and a long term parallel so it could take some time to work out the kinks before an extension higher. The long term cycle is the most intriguing of all. “Did the 96 month (8 year) cycle low count just nail a major GBP/USD low (cycle is in February but give this some wiggle room)? 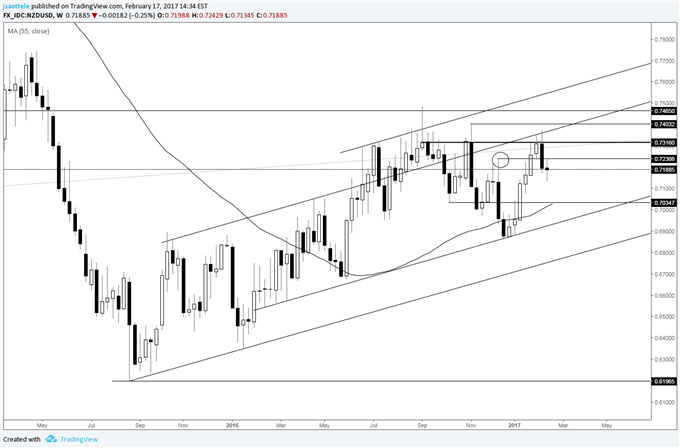 Kiwi remains capped by the upper end of its 2016 range and a channel line. Peaks in NZD/USD since the summer have been anything but clean but that may be changing as Friday’s high was right at the December high. Clean reactions at clean levels is a plus. I lean towards the downside with focus on the 55 week average (maybe a bit below). 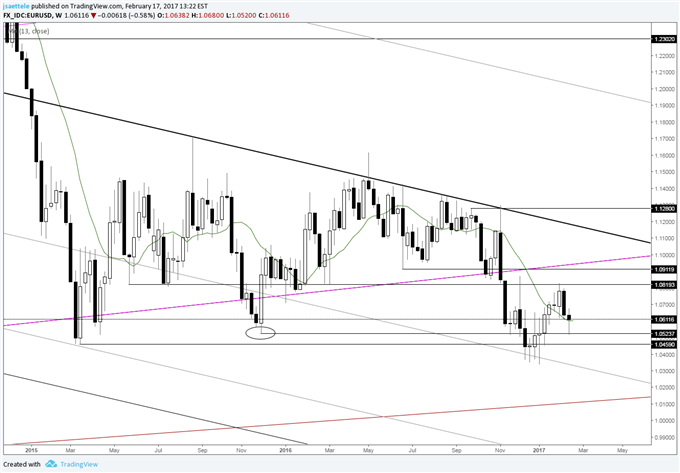 USD/CAD is still stuck although the inside week at support is promising for a low. 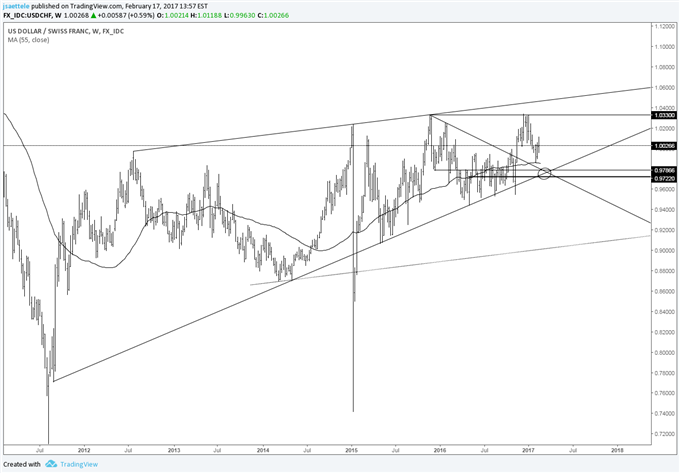 Loonie remains above long term parallels. From a momentum perspective, RSI failed at 60 on the latest rally. This characteristic is associated with either a downtrend or sideways trend. Also, the rally from May 2016 is corrective so the bias is for impulsive weakness but I don’t like being bearish into support (parallels). The GBP/USD is trading lower to close the week, as GBP Retail Sales figures have come in under expectations. Expectations for today’s news were set at 3.9% (YoY) (Jan) but were released at an actual 2.6%. 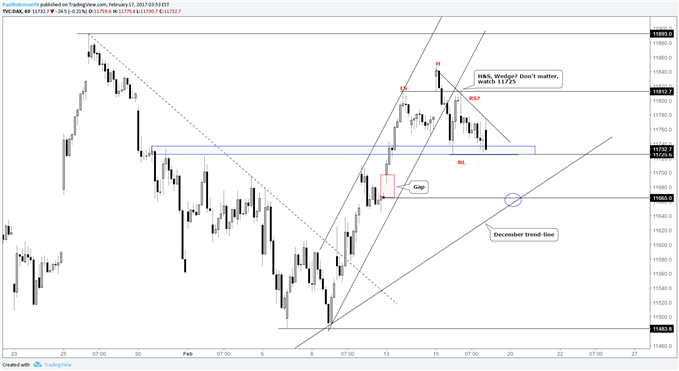 Next week traders will again be looking towards data to guide the GBP/USD. Wednesday we will see the release of UK GDP figures (YoY) (4Q P) which are expected in at 2.2%. Technically the GBP/USD is now trending lower in the short term. Today’s decline on missed Retail Sales figures has now placed the pair back below its 10 Day EMA (exponential moving average). As the pair declines, this average which now resides at 1.2479 may be seen as a value of resistance. Traders should note that today’s decline has the GBP/USD trading back in the direction of its long term downtrend. For reference, the 200 Day MVA (simple moving average) can be found at 1.2717. Intraday the GBP/USD has fallen significantly below today’s central pivot found at 1.2488. 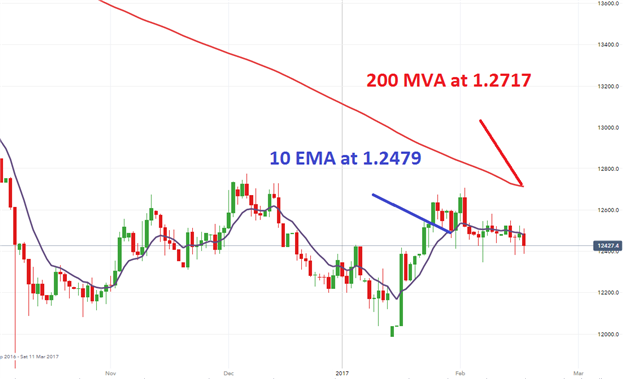 Not only has bearish momentum significantly increased from this point, but the GBP/USD has now broken through the first value of intraday support at 1.2451. 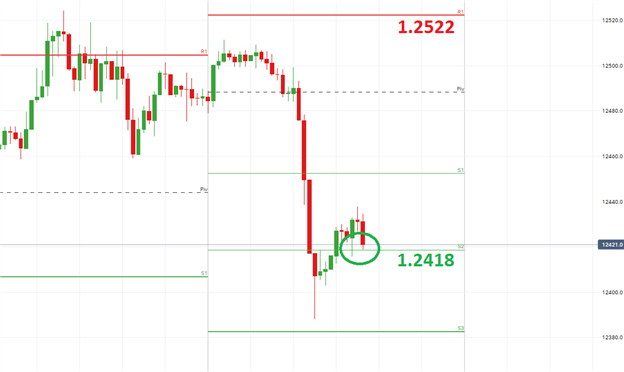 If the pair continues to fall, traders will next look for the pair to be supported at the S2 and S3 pivots found at 1.2418 and 1.2382 respectfully. 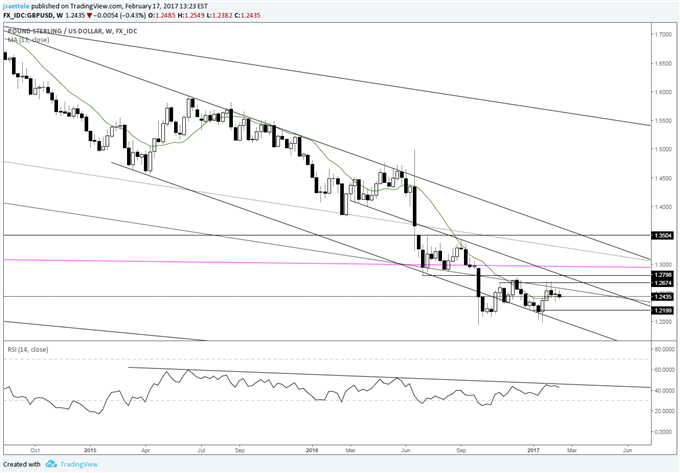 If prices reach 1.2381, it should be noted that the GBP/USD will be trading at new weekly lows. While prices are trading well below our first value of intraday resistance, it should be mentioned that today’s R1 pivot is found at 1.2522. 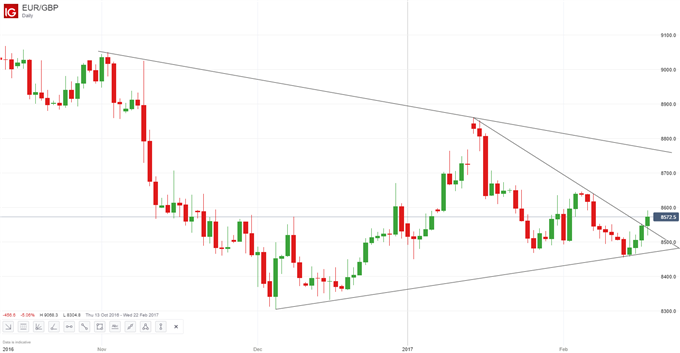 A rebound to this point would place the GBP/USD back towards yesterday’s close, and may suggest that the pair is consolidating before a larger potential breakout next week. 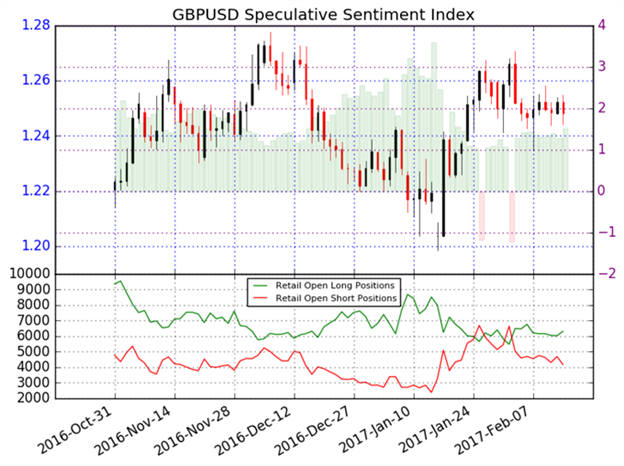 Sentiment totals for the GBP/USD remain off of extremes with current SSI readings at +1.64. At its current reading, this implies that 62% of traders are long the GBP/USD, while 38% remain short. When read as a contrarian indicator, this value suggests that the GBP/USD may continue to trend lower. In the event of a further bearish decline next week, traders should look for SSI totals to reach extremes of +2.00 or greater. Alternatively in the event of a bullish reversal, it would be expected to see SSI figures move back towards more neutral readings.